have while you pursue your goals. think you would be happy with more. Good morning Sheila and thank you very much! 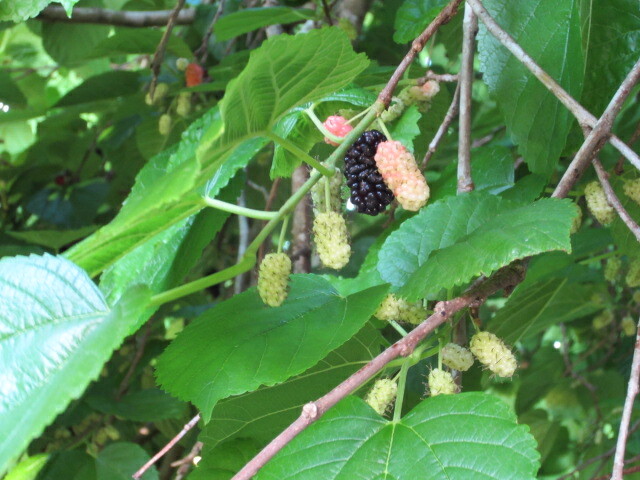 Our mulberries aren’t quite ready here. Maybe July and August. Gratitude is so essential for growth. I certainly don’t need anything more. It’s a gloriously cloudy day with a little sun and a little rain. Perfect for the flowers. April showers bring all the flowers, etc. 🙂 Have a wonderfiled day. Yes, ‘gloriously cloudy’ with a good chance of showers here today. Rain is rare in the Spring in Florida. So when it happens we are grateful. Thanks for your kind remarks Marlene. Enjoy life! so true and just the things I needed to hear today, we need to be be grateful for what we already have. Funny thing about ‘truth’, if it’s true for you it’s true for me too! Great quote, and new author for me; thank you – and buen provecho! Excellent reminders Eddie, we are indeed grateful for what we have.. And often the gifts we already have within our lives are taken for granted until they are no longer there. These are reminders we all need to hear now and then. This is Mulberry season! The branches are heavy with new sweetness! Am very well Sue, thank you. Spring projects underway. Painting, painting, painting! We’ll be picking them soon!